Space Needle - Built in 1962, the Space Needle served as the symbol of that year's World's Fair. 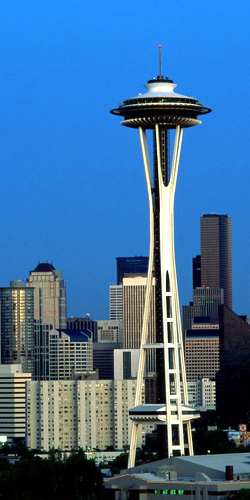 It has since become the symbol of Seattle, and one of the most recognizable structures in the world. The Space Needle is privately owned. City of Seattle Historic Districts - Since 1970, Seattle has established seven historic districts: Ballard Avenue; Columbia City; Fort Lawton; Harvard-Belmont; International District; Pike Place Market; Pioneer Square.